← What comes after Stainless Steel? Apparently lowering lighting and playing softer music at fast food restaurants leads to “increased satisfaction and reduced calorie intake” according to Cornell University. Very interesting findings, especially since the research shows that the adjusted environment did not change what people ordered, only what they consumed. So one would hope that the findings would encourage fast food restaurants to adjust their environment to help patrons consume less and hopefully have fewer problems with obesity, something for which fast food chains are often blamed. But I was thinking about it, and a large problem came to mind: part of the success and appeal of fast food chains is that they are fast. Affordable restaurants often alter their environment, including the (non) comfort level of their seats, to encourage table turnover and, thus, profits. Think energetic music, rock hard chairs, and bright lighting. 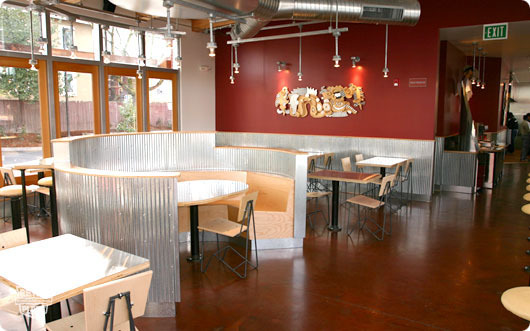 Do Chipotle’s plywood booth and chairs ring a bell? Does dimming the lights and softening the music go against the energy level that one expects from a fast food chain? Would it have a negative effect on providing ample seating for patrons by encouraging people to relax and stay a while? It is a great finding to know that lowering the lights and music allows a diner to slow down and enjoy their food a little more and eat a little less. We knew that focusing your attention on your meal, instead of the television or another distraction, often results in fewer calories consumed. So it is not surprising that slowing down the frenetic pace of the fast food environment would have a similar effect. It is certainly a good lesson for all of us to learn to stop and smell the roses (or the french fries) while we eat.